Dating from 1865, prior to becoming a hotel the building was lived in by Queen Isabella II who left here for exile following the revolution of 1868. 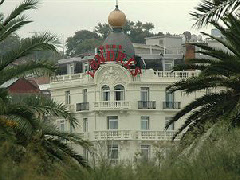 It subsequently was transformed into accommodation with one of its earliest guests being King Amadeus I of Savoy in 1872. After having been used also as the Casino Kursaal and temporarily as a hospital, for a short while it was known as the Hotel Ingles, then Hotel London in 1902. Many a famous name has sought rest and relaxation in San Sebastien, Henri Marie Toulouse-Lautrec, and Archduchess Elizabeth of Austria among them. The hotel’s most famous – or infamous – resident, however, was Mata Hari - a lavish suite is today named in her honour.